Book On Demand CPD activities online in 3 simple steps: 1. 2. 3. 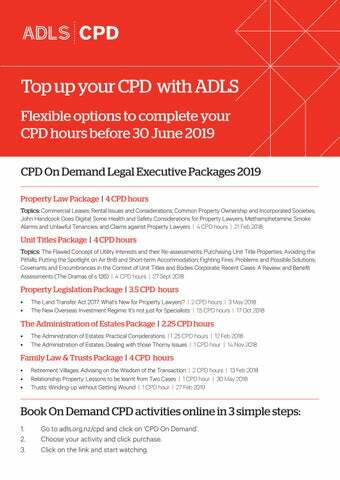 Go to adls.org.nz/cpd and click on ‘CPD On Demand’. Choose your activity and click purchase. Click on the link and start watching. Terms and Conditions: For full information, including terms and conditions, and our cancellation policies of the ADLS CPD On Demand packages, visit the ADLS website at adls.org.nz/cpd. The selection of topics offered in each CPD On Demand package are as stated and cannot be changed or substituted. There is a processing time of 15 minutes from the date of receipt of an order before each CPD On Demand package becomes available. Only the person named on the registration can claim the CPD hours allocated to each On Demand activity. Each On Demand activity is available to be viewed within an extended period once purchased.